If you have a solution of unknown concentration -- for example, a water sample that's greenish or brownish -- you can compare it to two samples whose concentration you do know to calculate the unknown one. This lets you measure not what something is, but how much of it there is in a sample. This activity is not yet complete -- it's under development. Please offer comments/feedback/questions! But I'll be updating it over the next few days. Thanks! Finally, note that you may get more consistent results with a more rigid setup, such as with the Lego Spectrometer. 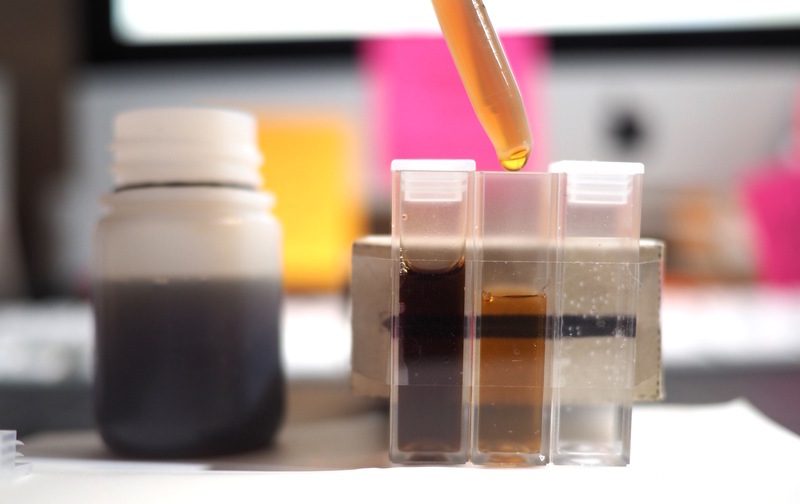 In this picture, the right sample has 1 gram of instant coffee crystals added to it, and the left sample is pure water, so a concentration of zero. The middle has an "unknown" amount of coffee crystals in it -- I use quotation marks because I actually know, but I won't reveal this until the end. All we know from looking at the center it is that it's less concentrated than the right sample, and more concentrated than pure water. But to take that further, by measuring how opaque it is with the spectrometer, we can determine precisely how much coffee is in the middle. Note that this should work with any coloring -- food coloring, or muddy (turbid) water from a river. Here, see smartphone and spectrometer to the left, then the cuvettes holding the samples, then a thin piece of white paper to diffuse the light, then a strong LED bicycle light. Note that this is not a very stable setup! More on this below. For repeated measurements to be consistent, it's very important that your setup remain stable. If you're using a paper spectrometer, consider affixing the parts in a rigid box, and reinforcing it with more structural supports so that each time you scan, the angles and dimensions remain the same. In my photo above, I haven't done this, so my data may not be very consistent, but I wanted to show the whole setup photogenically. I recommend gluing things down inside a rigid box for your tests, and not moving your phone for the duration of your work. Notice added a thin piece of white paper to try to ensure that all three samples are evenly lit. If one gets less light, we might get a falsely low reading from it. When you collect samples, you can use a glass jar -- see Sampling for more resources on this. But for scanning, you need to carefully prepare each sample consistently. I used an eyedropper to fill one with pure water, but weighed the instant coffee crystals before adding them. 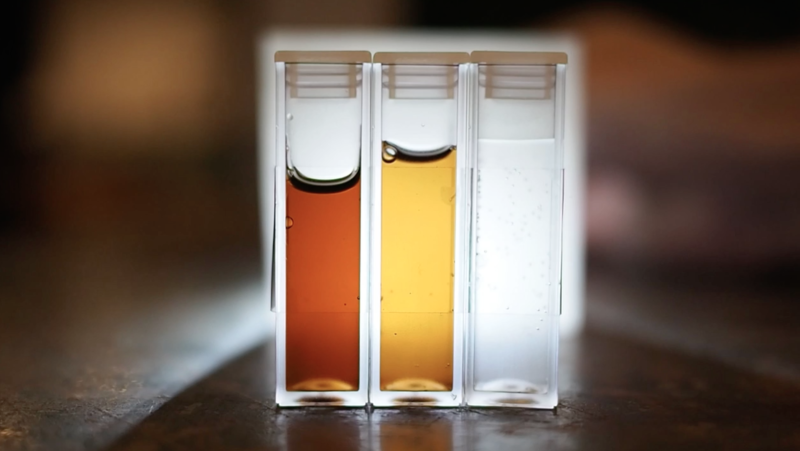 If you're using a reagent, the "positive control" -- the one with a known amount of what you're looking for -- would be the one on the right in this picture, and you'd add the same amount of reagent to each container. But in this case, I'm just measuring how much coffee is in each, rather than the color change of a reagent. We'll be scanning all three samples at once, which will help ensure the lighting conditions don't change when we make our comparison. 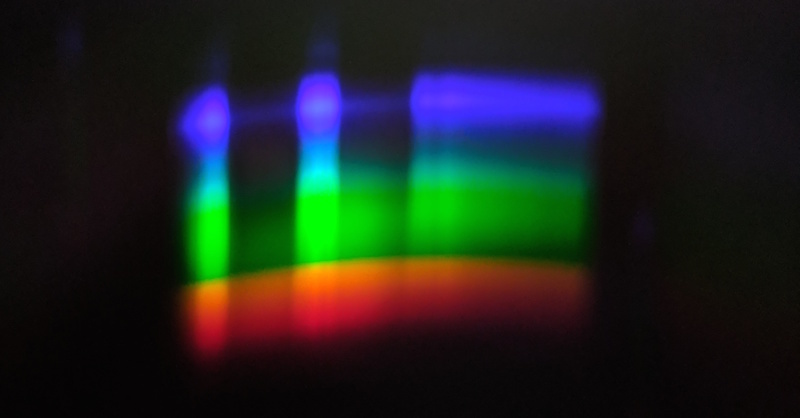 Here, see the three distinct vertical bands corresponding to the opaque, medium, and clear samples. Scanning all together is seeing some difficulties -- the light seems strongest at the center, so that throws the results. See comments for more as this activity comes together, and also check out Can a DIY spectrometer be used to measure water turbidity? and What's an easy way to compare two liquid samples with a spectrometer? Upload your spectrum to SpectralWorkbench.org three times -- one for each sample -- and save them as a set. Once you've saved three copies, open one and look at your spectrum's graph. You should see three distinct areas of your spectrum -- one for each sample. Using the tool, choose a cross section that intersects your first sample, the pure water. Title the spectrum "Water". Repeat this for your other 2 samples, labeling each. Note: we'll need to address the curvature of the spectrum. Once you've tested this out with a known sample, try it with river water, or something else unknown. Hi Warren I'm also working on a beers law based machine for testing one cuvette at a time and measuring the amount of light penetrating through the sample. Now I know i'm kinda new to this group but do you think adding an arduino to a project would be to complex ? I wanted to increase the resolution and data being delivered so I added a GA1A12S202 Log-scale Analog Light Sensor and this requires an Arduino and a small amount of coding that I would of course provide when I publish this design. This circuit only has 3 wires to connect and can be done by most people I just wanted to throw the idea at someone that has more experience with Public Lab Members. Ohh and here are some photos of the light sensor and the machine I have designed. OK, my next thought on this would be to scan 2 at once instead of 3, so that at least any non-evenness would be symmetric horizontally. But I'm not sure exactly -- should I then take 2 scans, one comparing the original against the blank, and the other comparing against the positive control?